There are a lot of different types of safety and security equipment for all types of applications. Safety and security equipment is about reducing risk; reducing the risk of injury, theft, pilferage, damage: keeping personnel, product, and equipment safe and secure. Getting product onto mezzanines requires elevating the product. Most organizations do not have vertical lifts, so the way mezzanines are most typically loaded is by industrial lift truck. That means that a section of handrail must be removed. That is not true if there is a mezzanine safety gate in place. With a mezzanine safety gate the edge remains protected from a fall hazard and product can still be loaded onto the mezzanine. CSI provides a large array of safety and security equipment online and through its professional personnel. 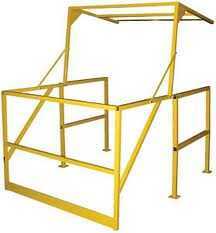 We also offer Wire Mesh Panels, Machine Guarding, additional rack safety items, Guard Rail, and Handrail. Think safety! There is no topic which offers a higher return. To ignore safety could result in significant cost due to loss of life, significant injury, impaired morale, and loss of operations. The cost experienced from any of those individually would far exceed any investment into handrail.